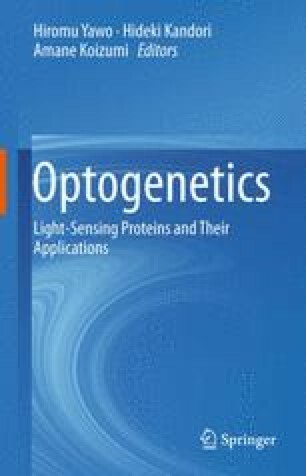 In the field of optogenetic tissue engineering, the most recent and widely accepted clinical research method is for a channelrhodopsin to be expressed in nerve cells through exposing these cells to light since the subjected nerve cells become stimulated, or inhibited, by light (Kehoe, Science 273:1409–1412, 1996; Bhaya, Proc Natl Acad Sci USA 98:7540–7545, 2001; Terauchi, Mol Microbiol 51:567–577, 2004). Other clinical methodologies are also in development whose purposes are to be used in controlling interactions between various proteins through exposing the said subjected nerve cells to light. When one considers applying these methods of optogenetic tissue engineering to any part of the human organs, the most relevant and effective subject organ is the eye. Visual cells of the eyes possess visual pigments made of photoreceptor proteins, and those proteins have high photo sensitivity and responsiveness. It is also a known fact that collection of data from clinical application for analysis is relatively easy since the tissues are marked in the process of tissue engineering (Corredor, J Neural Eng 10.1088/1741-2560/6/5/055001, 2009).